Put 1 cup of all purpose flour in a kitchen machine. Add the sugar and a pinch of salt, pulse for 1 or 2 times to mix. Add the margarine and pulse to “cut in” the butter. The mixture will be crumbly. Remove the blades from the kitchen machine. Add 2 or 3 tablespoons of cold water and using a fork, blend the mixture into a soft dough. Flour the counter space and rolling pin and roll out the dough to fit a 9-11 inch pie pan. Place the dough in the pie pan. While making the filling, put the pie shell into the fridge to set hard. When I first made this recipe, it called for smaller amounts of spices. Bit I was disappointed with the result, we found it quite bland so I tweaked the amounts a bit. 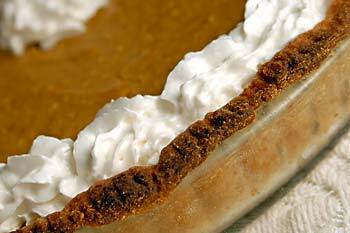 Taste the filling before you pour it into the pie shell, perhaps you’d like a bit more even. Cook the fresh pumpkin until it is soft (about 10 minutes) and puree. (Or use canned pumpkin). Puree the tofu and add to the pumpkin. Add the sugar and spices to the pumpkin and mix well. In a saucepan, dissolve the cornstarch in the soy cream and cook over a med heat stirring constantly. 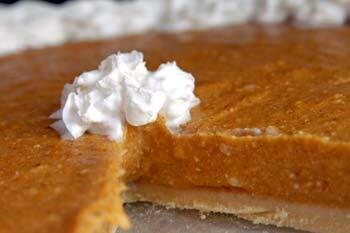 When the soy milk is thickened, add it to the pumpkin mixture and pour the mixture into a pie shell. Bake at 225 (C) about 1 hour. Remove from the oven and let cool to set. We enjoy it plain or also with whipped soya cream on top. Particularly nice with coffee. 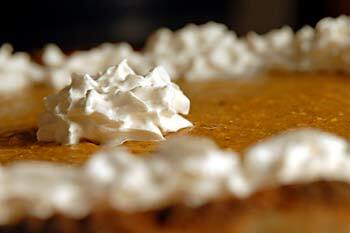 Posted by Chris Walker on November 23, 2006 in Desserts and Sweets, Pumpkin.